History is, one might say, somewhat waterlogged. Since water is absolutely essential to human life, it should not be surprising that it is an important component of human history. Yet it is surprising how little attention water receives in historical accounts. Humans have generally settled near convenient sources of water. Most of the great ancient civilizations depended on a particular source of water. For example, the Egyptians centered their civilization on the Nile. Mesopotamia (Greek for the land between the rivers, the Tigris and the Euphrates) was the home of several important ancient empires. Chinese civilization was located principally in the Yellow and Yangzi river basins. In the case of these great civilizations, there usually is considerable discussion of water as a fundamental aspect of the civilization in question. Water facilitated relatively rapid transportation prior to about 1850 C.E. In the era of exploration and discovery from the late 15th through the 18th centuries, Europeans explored all the major oceans and seas. Water was also thought to be an essential aspect of imperialism from the 16th century on (this is known the "salt water fallacy," the idea that an empire must be separated from the mother country by an ocean; this is why neither the Russian nor the American continental empires were seen as comparable to the Spanish, Portuguese, British, French, and Dutch empires). The history of exploration and trade remains a major area of historical scholarship dealing with water. Some of the most innovative scholarship concerns the way in which a body of water ties together what might otherwise be disparate areas and provides the backbone for a common culture. The great example of this approach is Ferdinand Braudel's The Mediterranean and the Mediterranean World in the Age of Philip the Second, 2 volumes (1972, 1973). A recent example, shorter and less scholarly but highly readable, is Neal Ascherson, Black Sea, 1995. Water was also an important source of power in the period before the Industrial Revolution. Even though steam power made water power less necessary, water remained an essential component in all kinds of manufacturing processes. Beginning with the Industrial Revolution, however, water increasingly becomes a hidden factor in human history. For many, it quite literally went underground, hidden from sight until one turned on a faucet or flushed a toilet. Increasing, there was a tendency to view it as something to master and control. This is, of course, in accord with a more general approach to nature as a whole: mastery and control. Anyone contemplating the rubric "Water in History" is faced with a sea of possible topics. I will be looking at two in particular. 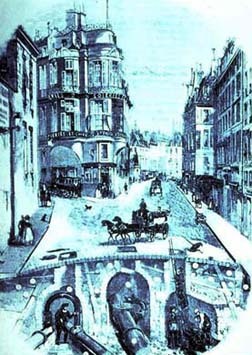 One, the improvement of water supplies and waste water removal in French cities at the end of the 19th century, illustrates humanity's capacity for using water to improve the material conditions of life. The other, Soviet efforts to construct canals and dams as part of the Five-Year Plans of the 1930s, mostly illustrates the follies humans commit in their attempts to master and control water. Between the two, we should get some insights into present-day dilemmas concerning the use of water in industrial societies.